On Saturday, January 21, 2012, thousands will once again March for Life in Dallas. Last year, empty strollers led a march of over 8,000 people through downtown in memory of 51 million lives lost to abortion since the 1973 Roe v. Wade decision. This year, even more are expected to take to the streets with thousands of yellow "LIFE" balloons – not only in memory of lives lost, but also in celebration of the many victories for life over the past year. The Dallas March for Life coincides with marches all over the country on or near January 22 – the 39th memorial anniversary of Roe v. Wade – including Washington, D.C., San Francisco, Austin, Tulsa, Baton Rouge, and Honolulu. The Dallas March is the largest in Texas. This year's Rally will feature Norma McCorvey – "Jane Roe" of Roe v. Wade. 7:45-8:45 a.m. Roe Memorial Rosary/Jericho Walk around the Routh Street abortion center, 4321 N. Central Expressway; Dallas Auxiliary Bishop Mark Seitz participating (800 prayed last year). Roe Memorial Bilingual Mass concelebrated by Bishops of Dallas and Fort Worth at Cathedral Guadalupe, 2215 Ross Avenue, with overflow tent outside (over 3,000 attended last year). Mass includes Procession of Roses (39 people bring a rose to the altar representing their million+ peers killed by abortion during the year of their birth since 1973). Praise & Worship Service at First Baptist Dallas, 1707 San Jacinto, featuring inspirational speakers and musicians, including former abortion provider and pro-life convert Carol Everett. 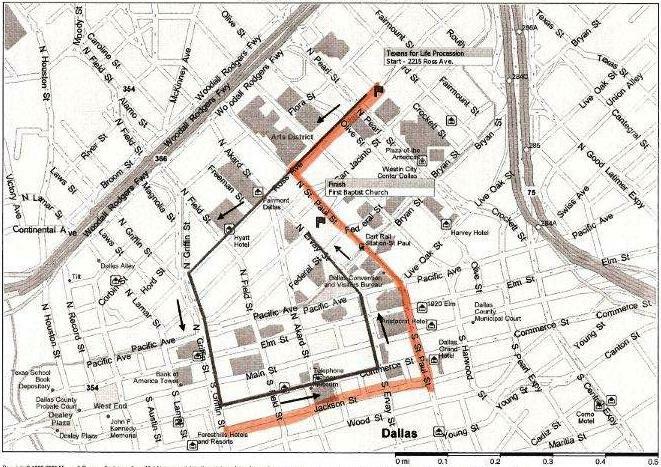 12 Noon Dallas March for Life begins from the Cathedral Plaza (corner of Ross and Pearl), continues to First Baptist Dallas (corner of San Jacinto and N. St. Paul) and ends at the Earle Cabell Federal Courthouse (route). Marchers witness to life, carrying life-affirming banners with thousands of yellow "LIFE" balloons; women who regret their abortions will also carry prominent signs. Rally for Life outside Earle Cabell Federal Courthouse (reverse side of courthouse at Jackson and Griffin). Thousands gather to listen to speakers at the building housing the district court where Roe v. Wade was first filed in 1970. For more information, visit www.dallasmarch4life.org. About the Catholic Pro-Life Committee: The Catholic Pro-Life Committee, a non-profit 501 (c) (3) organization, is the Respect Life Ministry of the Roman Catholic Diocese of Dallas, Texas. It is the largest diocesan-based pro-life ministry in the nation. Facts about abortion: More than 11,000 abortions are performed in Dallas County every year. Since the 1973 Supreme Court decision Roe v. Wade, more than 52,000,000 abortions have been performed in America.